This is not your typical “Mission” page. You know, the kind that you find on so many other websites, where the copy is written in a very serious manner and the tone is deadly earnest. The writing on sites like that includes words like commitment, dedication, teamwork, and excellence. No, you won’t find anything like that on this “Mission” page. That’s because our mission page is about a real mission. Really. Mission San Luis Obspio de Tolosa to be exact. Got it? Here’s a brief history about the mission. Misión San Luís Obispo de Tolosa is a Spanish mission founded in 1772 by Father Junípero Serra in the present-day city of San Luis Obispo, California. 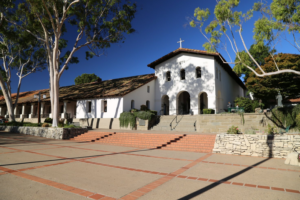 The Mission church of San Luis Obispo is unusual in its design in that its combination of belfry and vestibule is found nowhere else among the California missions. The mission’s walls, which are 50 to 60 feet high, were built according to Vatican law. This law stated that churches were to be built as tall as the local tree – in this case, the pine. The church, with a long secondary nave forms an L-shaped church, the only one of its kind among the California missions. Father Luis Antonio Martinez, who managed the mission for 34 years, grew a large mission vineyard. He sold some of this wine to the other missions when they couldn’t grow their own, and also exported it as far as England and Russia. Yep, that’s our mission. What’s yours? The Advert wants to know. Don’t have a mission? Get one.